Visit Orkney and book your stay at The Peedie Hoose, a luxury stone cottage in West Mainland. The Peedie Hoose is conveniently located just outside the village of Dounby in the heart of the West Mainland. The town of Stromness is only a 15 minutes drive away (9 miles) and you can reach Kirkwall, the capitcal of Orkney in about 20 minutes (15 miles). 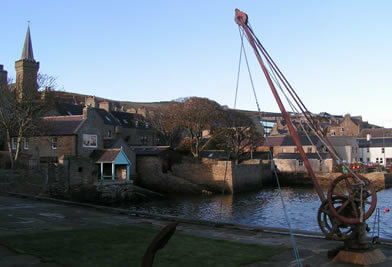 Both have harbours, museums, places of interest, many shops, bars, cafes and restaurants. Many of the famous tourist sites such as Skara Brae, The Brough of Birsay, The Ring of Brodgar and Maeshowe are only a few miles drive from The Peedie Hoose. Trout fishing lochs (free in Orkney) and RSPB Bird Reserves such as Marwick Head and The Loons are also nearby.